Thousands of bloody Mary recipe seekers have turned to the popular website, My Big Fat Bloody Mary, for bloody Mary mixes and recipes. The writers and staff at MBFBM have, in some readers’ opinions, taken a simple hangover cure and turned it into a colossal waste of time. Pages and pages of recipes and techniques are handed down with such confidence and authority that many have accused the authors of outright arrogance. One of the staff members has even dressed himself in a tuxedo and shot a video designed to teach the masses how to make a bloody Mary. In the video, a high priced actor who calls himself, “Greg,” denounces such gourmet bloody Mary standard elements as measuring cups. He goes on to tell viewers to avoid taverns that use any type of bloody Mary mix, instead offering what he calls the best bloody Mary recipe. Recent reports that My Big Fat Bloody Mary and fresh bloody Mary mix purveyor Demitri’s have struck a deal sent shock waves throughout the bloody Mary community. In a recent bloody Mary mix review, the cocktail mogul raved about the Demitri’s line of bloody Mary seasonings. Apparently the bloody Mary elite at MBFBM plan to start advertising and promoting Demitri’s line of bloody Mary seasonings, rimmers, garnishes and even beef straws. 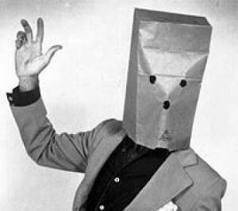 The spokesman insisted upon anonymity, so I’ll simply refer to him as MBFBM. GREG: Good morning and thanks for taking time for this interview. MBFBM: Good morning. It’s my pleasure. Care for a drink? GREG: Ha ha, no thanks. It’s 8a.m.! MBFBM: Well, it’s 9 a.m. somewhere. GREG: Well, I want to get right into this. According to sources rather high up in your organization, My Big Fat Bloody Mary plans to endorse and even promote products from the bloody Mary seasoning gurus at Demitri’s. Forgive me but, hasn’t your site consistently railed against pre-made bloody Mary mixes? MBFBM: Well, it’s true that we have never endorsed or supported a pre-mix of any kind. GREG: So, might your critics not accuse you of selling out? MBFBM: You’re damned right we’re selling out! This stuff is fantastic. The ingredients are nothing that we wouldn’t put in our own bloody’s. All four flavors; the Classic Recipe, Extra Horseradish, Chilis and Peppers, and Chipotle -Habenero are better than 95% of the bloody Mary’s I’ve been served. I can whip up a fantastic bloody Mary in less than 1/3 the time it normally takes me. That leaves more time for drinking and fun. GREG: So, you’re doing this for altruistic reasons only? MBFBM: We’re not stupid. These guys are paying us a TON of money. GREG: Your critics have accused your organization of creating three different websites that are all basically the same and simply designed to increase traffic to your material. What do you say to this? MBFBM: That is absolutely UNTRUE! We have four different websites that are all basically the same and simply designed to increase traffic to our material. GREG: Most of my readers have a fairly short attention span so let me close by asking what your future plans are in the gourmet bloody Mary niche. MBFBM: I think I’ll have a Chilis and Pepper from Demitri’s. Sure you won’t join me?